Everyone who enters the field of astronomy has a great story of what initially sparked their interest. My personal story began when I turned 13 and my grandfather bought me an astronomy book for my birthday. The book was the spark, but what fed the fire was participating in the Tacoma Astronomical Society (TAS). Members of TAS hold public viewing nights twice a month and volunteer at schools, girl/boy scout troops, weekly farmer’s markets, and give presentations at libraries. Participating in many of these events with TAS through my teenage years developed astronomy into my passion, well before I needed to think about what the best programming language is to learn or decide on a graduate school. Science is advancing more rapidly than ever, and astronomers have the privilege to work in a field where people of all ages get a certain thrill from hearing about new discoveries. I call this the Hubble effect. People are fascinated by space, and it’s easy to see why. Evidence, see: the space race, black holes, the big bang, dark matter/energy, extrasolar planets, etc. Mention any of these topics to a stranger in an elevator and you are guaranteed to have an interesting conversation going before the doors open back up. Mention them in an elementary school classroom and you can cancel whatever you had planned for the rest of the day. In fact, it is just as much fun to teach someone about these topics as it is for the listener because you have an active audience that is truly interested in what you have to say. Technology is also a driving force behind the public’s interest in astronomy. The Hubble Space Telescope captured the attention of the world with its spectacular images of comets smashing into planets, galaxies smashing into other galaxies, and the deep and ultra-deep fields which bear its name. Even as bigger, more technologically advanced telescopes were constructed on the ground, Hubble developed a “Little Engine that Could” aura as one servicing mission after another revitalized the front line in astronomy. 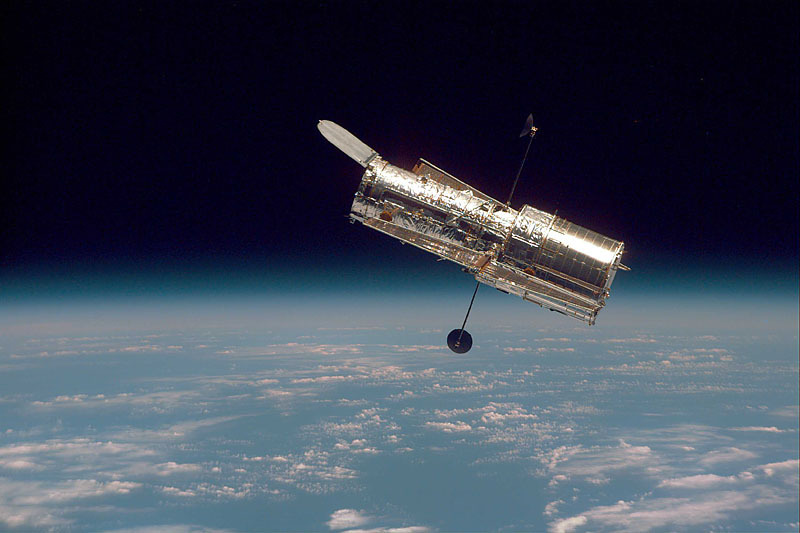 To this day, Hubble is the gold standard in observations, and the public is well aware of that. However, I won’t give all the credit to the telescope and the media. A fair share goes to NASA for creating an outreach strategy that generates a buzz around each discovery made with Hubble. We live in a spectacular time for the science as new telescopes like Kepler are pushing the boundaries of planets we can detect. Did you know that Kepler’s telescope is so powerful that, from its view up in space, it could detect one person in a small town turning off a porch light at night? Not only that, but it does this for ~150,000 stars simultaneously to discover an earth-like planet! Trust me, your neighbors will think this is more amazing than you do! There are many things you can do to encourage public interest in astronomy. Usually, the things that come to mind are the big events like putting on a public observing night, giving a planetarium show, or launching Hubble 2 (wouldn’t that be nice!). But in reality, the best thing you can do is talk about your passion with others. Ask your local school district to connect you with classrooms that are studying the universe and volunteer your time for an hour to talk with them about, in their words, “super cool space stuff!” Take a pair of binoculars outside to an area with foot traffic, set them up on a tripod, and simply look at the moon, or in the direction of the Milky Way (let’s be honest, most of us live in the city and can’t actually see it). Invite people passing by to take a look. Even without the view of Hubble you will have excited individuals who will want to know about the structure of the Milky Way, ask you about how big the universe is, and inquire about all those fascinating topics listed earlier. It gets even better if you own a telescope or can borrow one from your school or local astronomy club. Many college campuses have active outreach programs already in place and are happy to help you organize an event or have you help them out! So why should you volunteer your time? Besides, there are lots of people who already do these things, and you need to focus on your career as a professional astronomer. I have several great reasons for you. The first is to develop your own passion. The nature of the field is much more detached than it once was from the eyepiece. Many observational astronomers cannot tell you what season the Andromeda Galaxy is visible in the evening, and many theoretical astronomers never need to travel to a telescope, let alone work with real observational data. It is easy to forget why we enjoy what we do when our eyes are glued to a LCD screen while pouring over buggy code and tables of data. Sometimes all it takes is one night with your eyes soaking in those ancient photons from a distant source to remind you that our corner of the universe is truly a spectacular place. The second is how much that time can do for your career. Everyone knows that scholarships, grad schools, fellowships, and grants care about your work; however, many are ignorant of the fact (until after the application process) that they also care about you as a person. Institutions want their money to go toward the advancement of science. One way works by directly funding your professional work, but the other is an indirect investment in your ability to share your knowledge with others. In fact, fellowships like the National Science Foundation (NSF) Graduate Research Fellowship, which you can apply for when you apply to graduate programs and in graduate school, require an entire essay regarding the broader impact of your work. Volunteering is a way for those institutions to see that if they invest in you, they are simultaneously investing in society. Such a deal! Finally, volunteering is simply a lot of fun! You may start out helping kids build a simple air powered rocket built out of rolled up paper, but before you know it, you are jumping onto that 2 liter bottle yourself laughing along with everyone else. You may start trying to describe parallax to someone who stops to look through your scope, but soon enough, both of you are running up and down the sidewalk trying to simulate the effect with several lampposts down the street. It is memories like these that make outreach so much fun and worth your while. So by taking the time to share your passion with others, the secret is…. you will be doing more for the advancement of astronomy and yourself. I love this post! If Dan hasn’t already given you enough reason to take outreach seriously, consider that the National Science Foundation Graduate Research Fellowship he mentioned actually weights your “broader impacts” (read: outreach experience) EQUALLY with the scientific merit of your application! One of the best ways to get involved in advocating for science can be to volunteer with existing student organizations at your university. As an undergrad, I had an absolutely wonderful experience as a volunteer for Michigan State University Science Theatre. For about two decades, ST has been performing interactive demonstrations in physics, chemistry, and biology in K-12 classrooms and at events throughout the state. I feel very strongly that my participation in ST was one of the most valuable experiences of my undergraduate career. It provided me with terrific public speaking and leadership experience, and developing new content for our performances was a very challenging pedagogical exercise. Most importantly, interacting with kids and watching their reactions to our demos was simply a blast! btw the hayden planetarian at the museum of science, boston finally reopened this past sunday, and the museum can use some more volunteers. plus it is actually possible for grad students to give live presentations there. I love this post too! How I wish to have the chance of doing such voluntary work! However, in my country, China, there are no such opportunities.